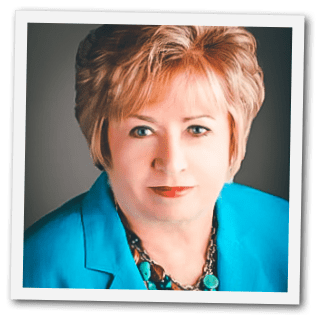 If you would like to know more about Swede Collection, here is an interview of me by Meranda Devan, author of The Swedish Furniture blog. Swedish design in American interiors is at an all-time high. Chosen for its qualities not as a fad or trend. White and light interiors are loved by so many. 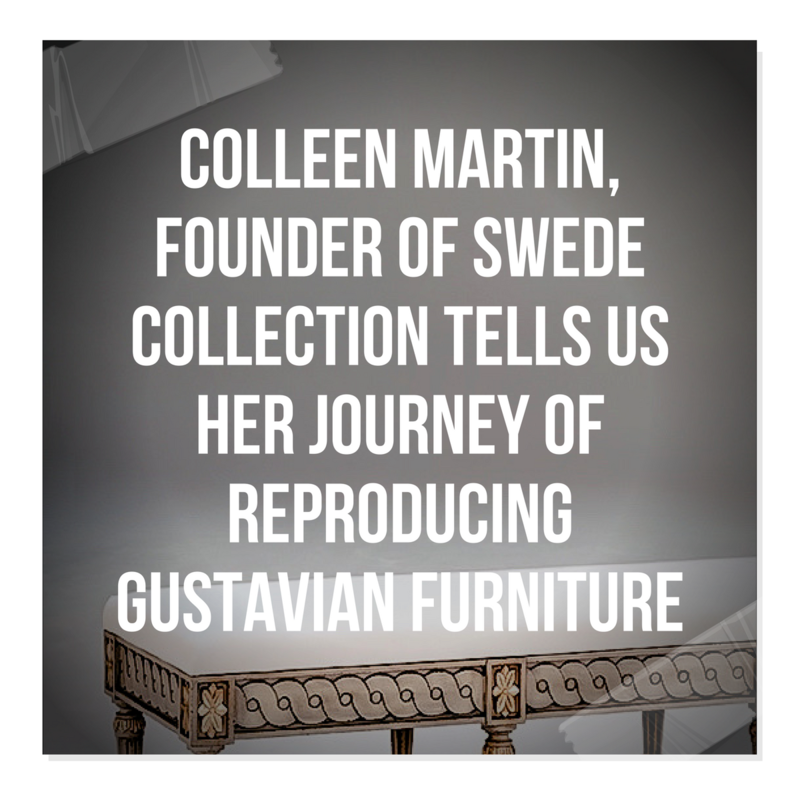 Today I am talking to Colleen Martin, Founder of Swede Collection, in the hand-crafted segment of the furniture industry, who is living her life passion reproducing Swedish furniture, particularly from the Gustavian and Rococo periods. Colleen was making console tables when the need for new dining chairs for her home arose. When she couldn’t purchase what she wanted nor find anyone to make them for her, necessity being the mother of invention, she decided to make them for her line. Swede Collection is shown at High Point market in April and October. The line can be seen at www.swedefurniture.com. Q: How did you get smitten and bitten by Swedish style? 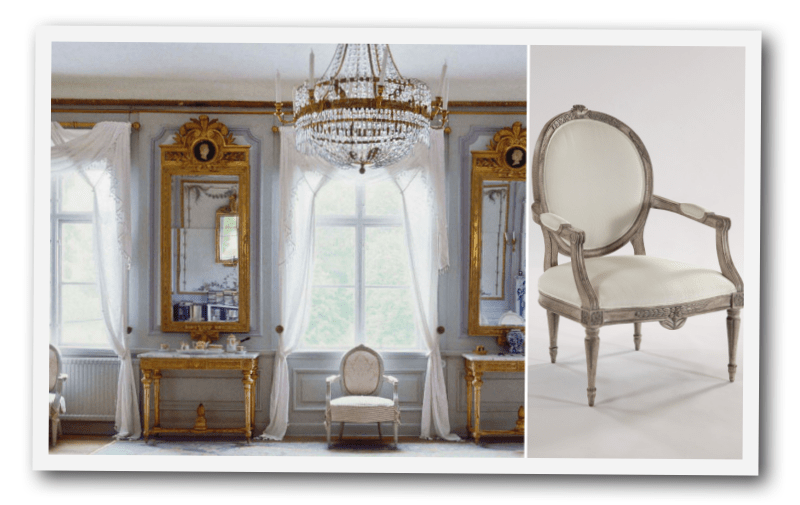 Gustavian is my favorite style as it makes my heart sing. To me it is eloquent, romantic and refined with a simplistic beauty. I do like a few Rococo pieces as well. What I love is that Swedish pieces have never gone out of style 200 years and counting. They are lasting, enduring and inheritable due to their design. Because they are not overly embellished, you don’t get tired of the look. I first decorated my homes in French antiques due to access as that was what was available in antique stores where I lived and as far as I could travel to antique shows. Keep in mind this was pre-Internet years so purchasing access was limited to as far as you could travel. Even though I lived in larger cities, Swedish antiques or reproductions were not available. I loved the straight legs of Louis XVI. I have always been a huge shelter magazine reader so that is where I first saw Swedish pieces and then realized Swedish was where my true love was which was similar to French Louis XVI. When the Internet made access easier, my passion for Swedish design intensified. One could see and purchase Swedish pieces in the US and Sweden easily. Q: Why do you think people fall in love with the Swedish look? The colors of white, pale blue/grey and pale aqua are very soothing to the soul. I find people who love Swedish style are deeply devoted to it. Perhaps it is the peaceful feeling people experience in light toned rooms where the furniture is not stark but not overdone either. Swedish pieces have great balance and detail. With the painted frames people get a departure from the brown tones of wood. Today, décor is all about the mix. What is so fabulous about Swedish design is that it fits smoothly in any décor and very surprisingly with contemporary. Q: Why did you decide to reproduce Swedish pieces? My mission was to make excellent quality hand-crafted and hand-carved Swedish furniture more accessible for everyone to enjoy in their homes. 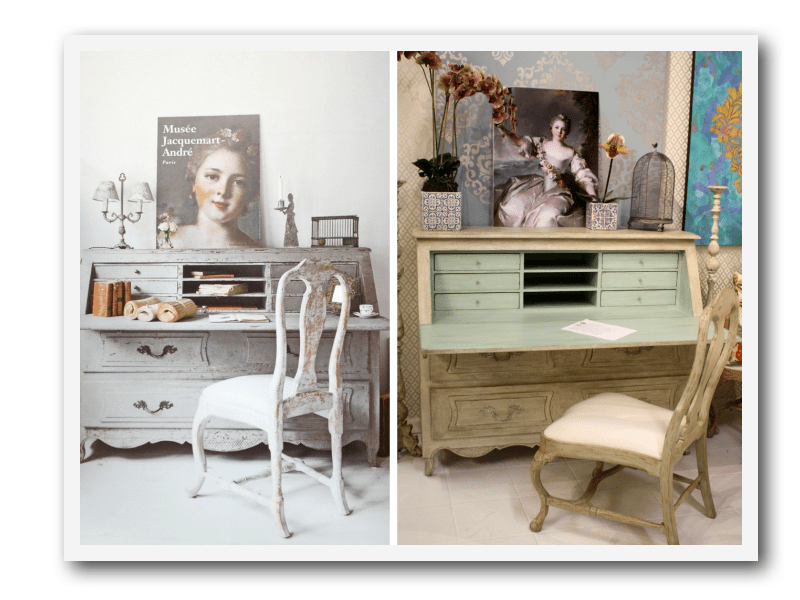 I traveled to Sweden and purchased antiques which I reproduce both in Gustavian and Rococo style. This is my passion. I wanted to bring back the hand-crafted pieces originally made in the workrooms in Stockholm by the masters. Swede produces unique pieces for interior designers but also has some pieces available to the public in the retail section. We are continuing to add to the website retail section smaller pieces that can be shipped via ground. Access to Swedish design is an important part of our mission. Erik Ohrmark 1747-1813 who made chairs for Haga castle for Gustav III. 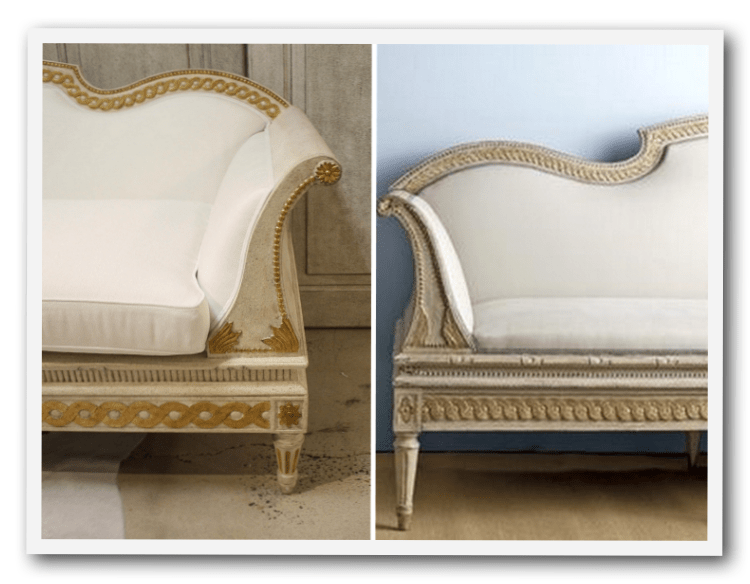 Although you read that Gustavian style furniture is credited to king Gustav living at Versailles, loving the French style but having the details relaxed for Swedish pieces in his homeland, I differ from that viewpoint by giving credit not to the king who was not a furniture designer, but credit to the master craftsmen and their apprentices working in their shops all over Sweden. The king may have commissioned their work for the royal properties but I believe the design was the masters’ who presented it to the king for his approval on the commission. I really don’t believe King Gustav came up with all these fabulous designs by himself. Pehr Ljung was a known master carver at the time who was called upon for difficult carvings. There were furniture “architects” and architects who did both buildings and the furniture within. Stockholm was a furniture center with many famous workrooms but these fabulous original designs were not exclusively created in Stockholm. Some masters specialized in making mirrors or clocks. I love researching these makers and am searching for information on women designers. 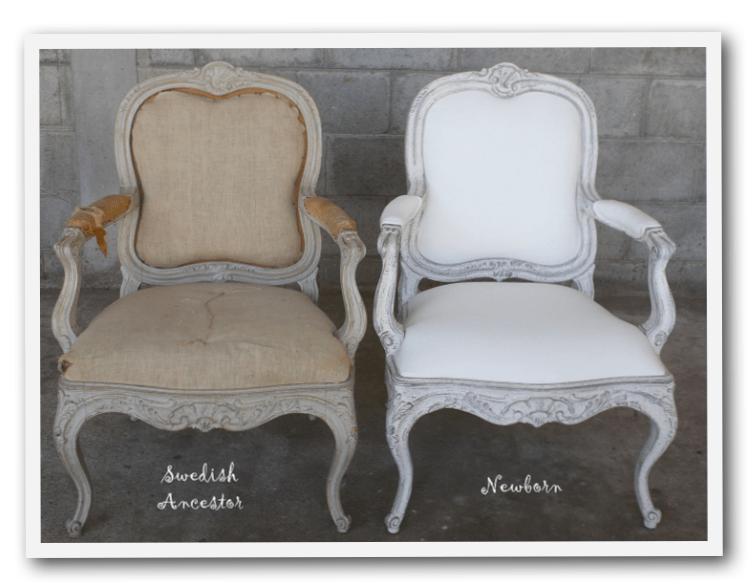 Q: In your decision to reproduce Swedish antiques, do you make exact copies? I like to honor the original creator that inspires me but I do change the scale and some details so it is not an exact copy. People were much smaller in body size at that time and particularly their chairs are too small for today’s people to sit in comfortably especially larger men. I didn’t want my husband or a buyer to “perch” on the chair, I wanted him to comfortably sit in it. Comfort is king in what I do. There is no point in making something nobody can sit in. I also produce in Maple, Ash and Cherry not Swedish Pine. I do believe these masters would be proud and thrilled to see that their designs are loved 200 years later by my bringing them back to life for today’s homes. For the most part, I own the original of what I reproduce. There are a few items in my line that my talented crew was able to duplicate just from a photo of the antique. Q: Can you find these signed original works for sale today? Yes, in Sweden, England and the United States and it makes my heart pound to find initials carved into the frame. There is also a mark on furniture made for the royal properties. When you see the carved initials IL for example, remember an “I” is a “J” so this could be made by Johan Lindgren. Pieces reproduced 100 years ago of the originals created 200 years ago are fairly available to purchase today. Although pieces can be found, price is another issue. A chair can run from $4,000 to 7,000. And, you may not be able to sit on it. That is the other reason I decided to reproduce these chairs – to make them affordable. Hand crafted chairs should be inheritable for generations to come and should last another 200 years just like their ancestors. I made the finishes on Swede Collection pieces blend seamlessly with antique finishes. Unless you have an expert eye, you probably couldn’t tell the difference. Making the new pieces allows me to fill in the blanks smoothly where unattainable pieces can’t be acquired. Q: Can you give us an example of what reproductions Swede Collection makes? I fell in love with this chair at Sabylund Manor. Bukowski’s auction house in Stockholm sold a set of these as well. I believe they look identical to ones made by Johan Hammarstrom which my talented team copied. 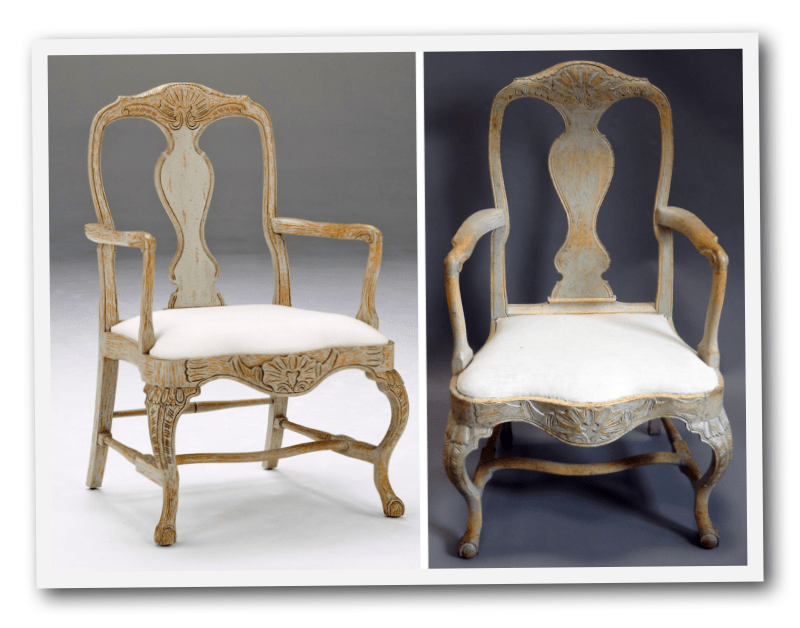 I purchased this antique Rococo chair on right and our copy is on the left. Everyone on Pinterest will recognize this desk in a home in The Netherlands on the left and Swede Collection’s version on the right. We also went to Jacquemart-Andre museum in Paris and photoed the Nattier portrait which we made into a poster in a larger size. Here is another example. Antique sofa on right with Swede Collection sofa on left. 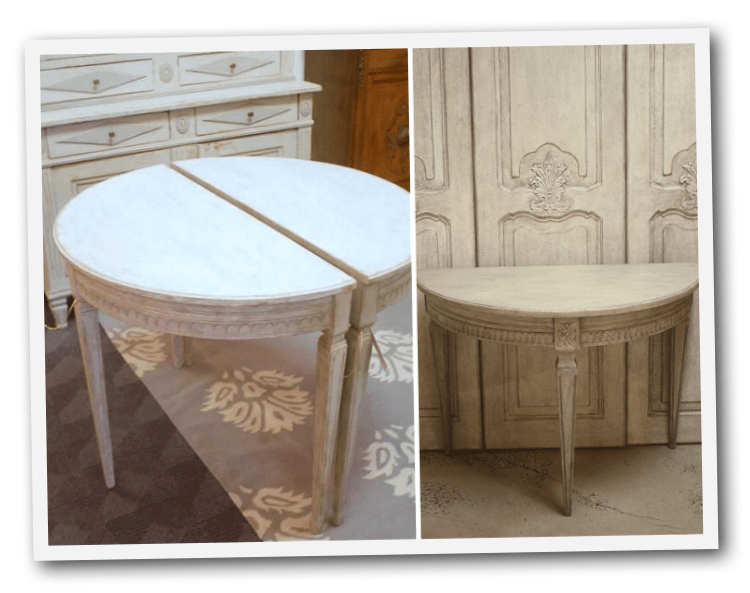 On the left are demilune tables brought back from Sweden on my 2014 trip and on the right the new Swede Collection one. 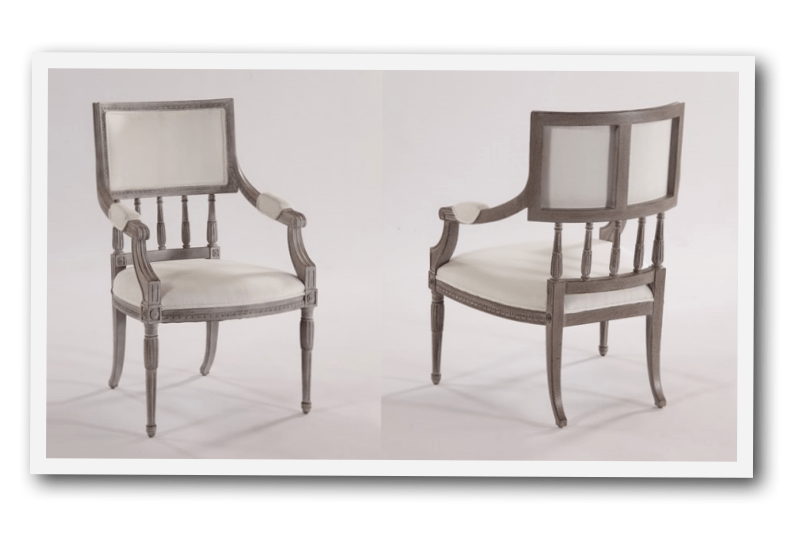 These Rococo chairs, antique on left, new on right. Q: What new pieces are you working on? We made some hand-carved boiserie panels that buyers at market kept asking to be made into sliding doors. For April 2018 High Point market, we are introducing four sliding “barn doors”. What is different about ours is that they are elegant with hand carving on solid wood or antiqued mirror glass inserts in beautiful soft colors. You would never find them on a barn. They are great used between a master bath and bedroom instead of a traditional door. They are beautiful separators of any spaces within the home. And, we are always making more chairs and benches. We are also working on a massive tall candlestick like ones found in European cathedrals. There is a never-ending list of items to make. I am having the thrill of my lifetime making these pieces. We got our one day of snow for the year yesterday so I am staying inside today. Looking at all the details which I adore on antiques and furnishings in the house and admiring them this afternoon. I really love antique hardware on Swedish pieces. Can't wait to plant my annuals in mid-April. © 2010 Swede All images and content on this site are protected by copyright laws. Please do not use images or content without our written permission.